KnowAtom’s professional learning model helps you develop a skill set that’s relevant and effective under the Next Generation Science Standards through customizable workshop sessions that continuously grow you and your team’s practice. Our goal is to empower every K-8 practitioner with the skills and knowledge to teach to transform. Get to know your new resources with an in-person professional learning session. 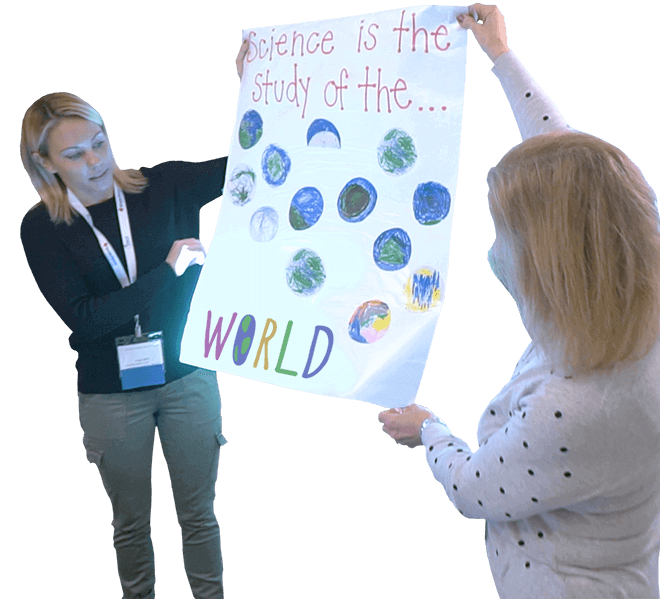 We’ll help your team deepen their understanding of a next generation model of science instruction with KnowAtom’s phenomena-driven science curriculum and hands-on resources. Participants will workshop best practices for creating an environment where their students learn every day as scientists and engineers. Support your classroom-level implementation of KnowAtom’s next generation science curriculum with targeted in-person or live online sessions. In these sessions, we will observe your students in action to provide direct, personalized feedback that you can use to hone pedagogy specific to engaging your students in more next generation-aligned instruction. Bring your teachers together to learn from each other, refining a shared approach to teaching and learning under the Next Generation Science Standards. KnowAtom’s formative learning walks allow teachers to concentrate on the student learning experience and reflect on the impact of pedagogy and expectations on student learning outcomes. This community-of-practice approach is designed to bring teachers out of isolation and develop capacity across the district for high impact teaching. One of the most amazing things for me was being able to see other teachers in action. I learned so much that helped me reflect on my practice. I was surprised about how much I got from it. I would come back from every session with multiple things I was going to try or change or tweak. I’d go back and share with my students what I was seeing. It was so wonderful to watch their reactions and for them to be amazed. Harness your district’s potential by digging into your state-level science data. Work with KnowAtom experts to uncover trends and opportunities hidden in your school’s or district’s data. We’ll help you understand ways to use the data to figure out what’s working and what’s not so you can better target your policies, expectations, and professional development to maximize student learning outcomes. KnowAtom has provided our district with so much more than a curriculum. The KnowAtom partnership has included unwavering support, attention, and commitment to each and every educator. 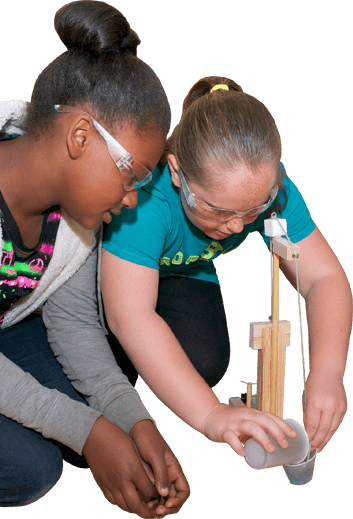 Join KnowAtom’s community of public school teacher leaders and administrators to learn new techniques for teaching science and engineering in a way that develops students’ ability to create, analyze, and evaluate, skills necessary for mastery of the new science standards. Each year, KnowAtom sponsors the TEACH Conference, a national forum for K-8 educators to engage in technique exchange that allows change to happen (TEACH). Click here to learn more. Connect with KnowAtom users around the world through our digital Peer-to-Peer Network. 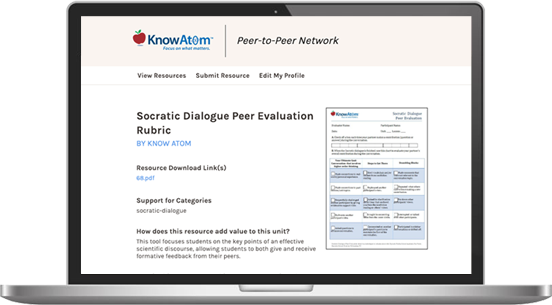 This platform provides teachers with the opportunity to share their own resources with each other, give feedback, and benefit from the perspectives of an experienced community of classroom teachers using KnowAtom to meet the unique needs of their learners.